In a culture that places so much emphasis on physical appearance, and weight in particular, it’s no surprise that many people have a love-hate relationship with the size of their bodies. A client’s weight loss one week can lead to sheer jubilation, followed by extreme guilt and shame after he or she “falls off the diet wagon” soon after. Many RDs can relate to their clients’ weight struggles through their own past experiences. But what happens when a dietitian’s weight issues aren’t a thing of the past? Can dietitians who have been trained in diet and nutrition be effective nutrition counselors if they still battle with weight themselves? And how much (or how little) weight denotes such a struggle anyway? It’s a hot-button issue, one about which many RDs are passionate. But this dietitian weight debate has many sides—and, for some, the issue really isn’t about weight at all. When it comes to the size of a dietitian’s body, does weight matter? According to Susan Linke, MBA, MS, RD, LD, CLT, a Texas-based dietitian who works primarily with patients who have food sensitivities, this answer depends on the type of advice an RD is giving clients. For dietitians offering total parenteral nutrition guidance or designing menus in a hospital office, Linke says people are looking for specialized expertise in these cases, and weight may not matter. But when clients are seeking advice on healthful eating or weight management, then they’re looking for role models, she says, and weight absolutely is an issue—and an RD’s image is important. Yet whether it’s a dietitian or a cardiologist, Linke says appearance matters because clients are using that information in part to choose the health care professional they believe is most likely to help them—and she’d do the same. “I wouldn’t think much of advice from a cardiologist if I knew he had had a heart attack,” she says. “Yes, genetics might play a role, but I’d rather listen to one that’s fit and has good cardiovascular health. 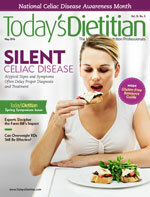 Lisa Ellis, MS, RD, CDN, a New York-based dietitian, agrees that as role models, how RDs present themselves is important. “Advice on regulating eating disorders coming from someone who even appears to be at the mercy of his or her own eating disorder may lack credibility, even if that advice was sound,” she says. “On the other hand, an RD need not have a perfect physique, just one that appears healthy. But what does it truly mean to practice what you preach, and what does healthy even look like? According to Sharon Salomon, MS, RD, a dietitian who previously wrote the article “Confessions of a Fat Dietitian” for Today’s Dietitian, this phrase brings up more questions than answers, and she notes that anyone (RD or client) would be hard-pressed to determine the healthfulness of her daily habits simply by looking at her. “We cannot make assumptions about people’s lifestyles and behaviors based on what they look like,” Wilson says, noting that this stereotyping behavior can lead to discrimination. Wilson cautions RDs against holding up healthy-looking physiques as an example because just as an overweight build could lead to wrong assumptions about poor eating habits, so could a thinner body type lead to mistaken beliefs that it was the result of healthful behaviors. First impressions based on appearance alone also won’t tell you whether a person recently gave birth to twins, is on an antidepressant or other medication, or experienced any other life event that may have caused a recent weight gain or loss, says Theresa Moutafis, MA, RD, LDN, CLC, a community nutritionist in the greater Boston area. Rather than weight itself, she says how an RD handles his or her life experiences is the example to demonstrate to patients. Salomon doesn’t believe a dietitian’s weight should ever be an issue, but she encourages RDs to live the lifestyle lessons they teach, focusing on overall health, not weight-based goals. Tupta believes dietitians would do well to remove weight loss from the picture and advocate instead, as a profession, for size equality and adequate care in health care settings, regardless of weight or size. But even if an RD may have a greater weight issue, Oyston still doesn’t think anyone should be deciding who gets to practice nutrition counseling based on weight alone. “That is just blatant discrimination,” she says. The only time Zuercher believes nutrition therapists’ body weight may be an issue is if they’re practicing disordered eating behaviors, at which point she says it’s certainly an issue. “Dramatic shifts in body weight can sometimes indicate the presence of food and body struggles,” she says. “That said, weight is only an issue if it’s symptomatic of underlying pathology. “Some of the very best nutrition therapists in the current field have overcome past struggles with an eating disorder or disordered eating,” Zuercher adds, noting it’s important that the issue is in the past. Especially in eating disorder counseling, where the clients already have a strong bias toward a particular body size by the nature of their illness, Zuercher says using the RD’s body size as a teaching tool can be a valuable lesson for the client, hence the importance of RDs practicing healthful behaviors. Of all professions, Rosanne Rust, MS, RDN, LDN, a nutrition communications consultant, says the nutrition community should be leading the charge with showing compassion about weight management and weight prejudice, not turning on its own. “We need to be the ones who help other professions become more compassionate,” she says. “We can benefit by showing that not only is there more than one way to eat a healthful diet but that health can come in different shapes, sizes, and colors. And we should support each other on that.